After reviewing the top trending apps in the United States and APAC region, Pixalate is now shining a light on the mobile app marketplace in the EMEA region (Europe, the Middle East, and Africa). 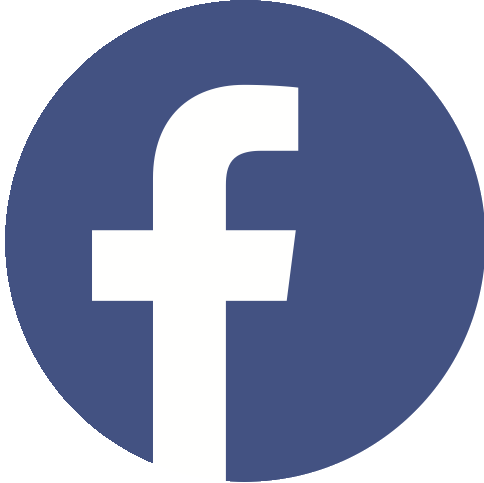 Below you’ll find the individual lists of the top 10 trending apps for both iOS and Android smartphones and tablets in EMEA from April 2018, based on programmatic display advertising share of voice. According to Pixalate’s data, PicsArt Photo & Collage Maker was the top trending iOS phone app based on programmatic display ad share of voice in EMEA in April 2018, accounting for 10.7% of the marketplace. LOVOO, a dating app, was close behind, with 10.2% market share. 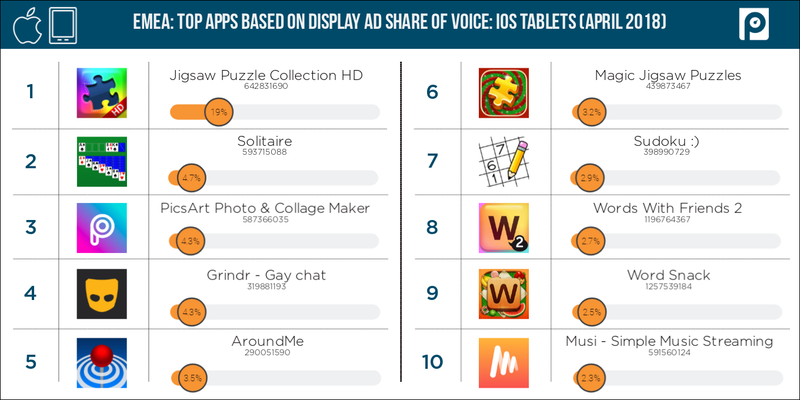 According to Pixalate’s data, Jigsaw Puzzle Collection HD was the most popular iOS tablet app in EMEA in April 2018, based on programmatic display ad share of voice. Solitaire was second, with 4.7% market share, followed by PicsArt Photo & Collage Maker — which was the top app on iOS smartphones. 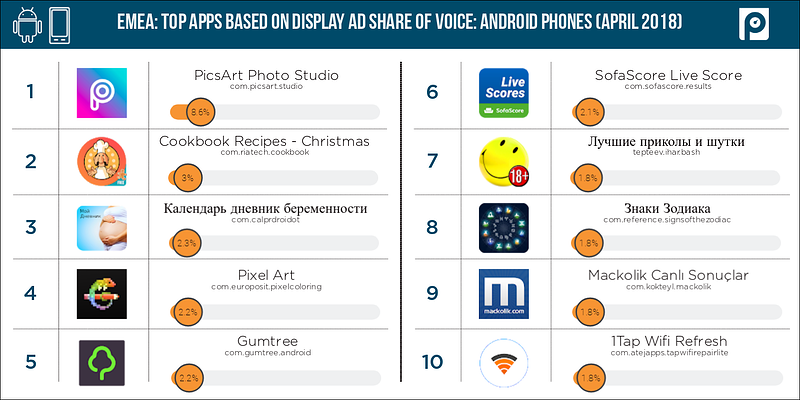 According to Pixalate’s data, PicsArt Photo Studio was the top trending Android phone app based on programmatic display ad share of voice in April 2018. The iOS version of this app was the top trending app on Apple smartphones, too. 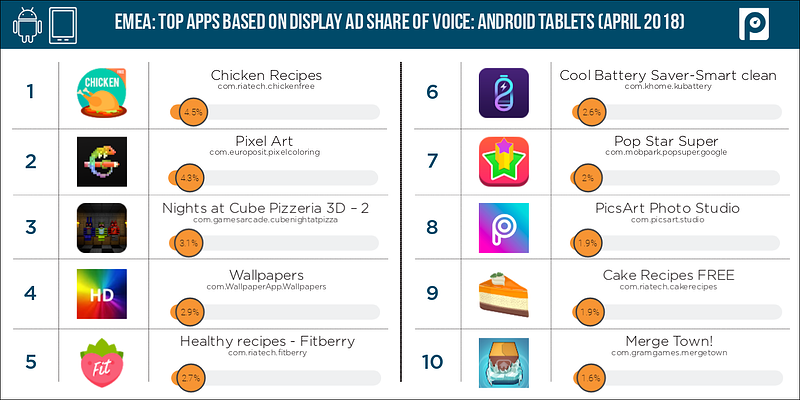 According to Pixalate’s data, Chicken Recipes was the top trending Android tablet app in EMEA based on programmatic display ad volume in April 2018. Pixel Art — which ranked fourth on Android phones — was second on Android tablets, with 4.3% market share. Other recipe apps including Healthy recipes - Fitberry and Cake Recipes FREE were also in the top 10 for Android tablets in April 2018.  Pixalate examined mobile in-app display advertisements sold via programmatic channels in the EMEA region (Europe, the Middle East, and Africa) throughout April 2018 for this study. 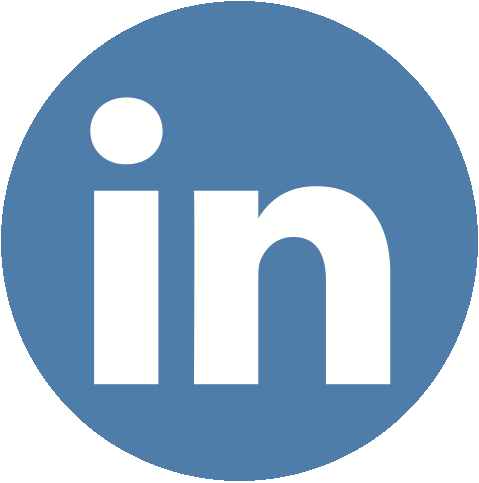 The data is based on activity within apps that engage in programmatic advertising in the open marketplace. 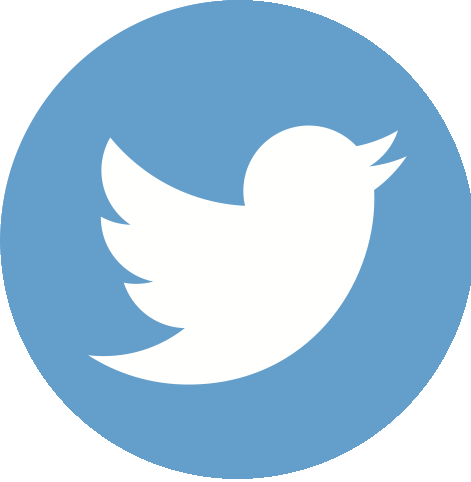 Invalid Traffic (IVT) — including General Invalid Traffic (GIVT) and Sophisticated Invalid Traffic (SIVT) — were removed prior to ranking the apps. 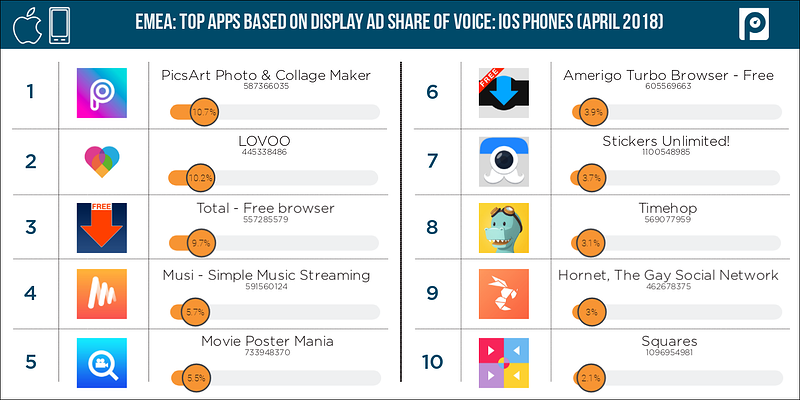 Each app's "Share of Voice" is determined based on programmatic display ad volume as measured by Pixalate. The data contained herein is based solely on Pixalate's Share of Voice analysis of programmatic advertising impressions in April 2018, and any reference to "top" or "trending" apps refers solely to an app's Share of Voice of programmatic advertising impressions.